For the past several months I have been following my outline to write the nine chapters of the book. A week ago I wrapped up Chapter 9. Now it is time for me here to reflect on what I think is the condition of the manuscript in its current form. Though I have been careful not to edit the material yet, I need to step back and just comment on what I have written thus far. 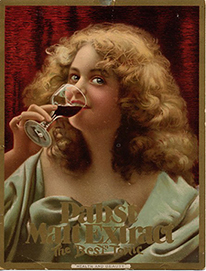 I have traced the story of Pabst Tonic through the eyes of A. Cressy Morrison, the Pabst Advertising Manager from 1887-1897. Though the book is about the Tonic, Cressy’s involvement with the Pabst product needs to be the story. What I need now for my next step is strengthen his contribution to the Pabst Best Tonic. I need to flesh out his involvement, especially in the advertising department, by examining such issues as what he developed, what he wrote, and what campaigns he orchestrated. The kernel of the story is here in these pages. Now I move on to add to what I have written. In that way I clarify what I have said and at the same time create a story that people will want to read.